I recently received this incredible shirt (I think the Easter bunny must stalk my Facebook page…but the shirt is also available online here). I loved the idea behind it; the T-shirt mingles big-state bravado that declared regional superiority, with small-state insecurity that begs not forgotten. Both sentiments, even if they are on opposite side of the spectrum, display an enormous sense of regional pride, communal identity. My first thought to check the truthfulness of this map was to see how many “Rhode Islands” there are in state Texas using this clever website that shows the number of areal units equal to the size of Rhode Island that are in any given country. And despite what that southwest bravado may lead you to believe, Texas isn’t its own country. So I needed to find a different website which lets you overlay any two places one on top of the other. This is a fantastic resource for help leverage your students’ local knowledge to teach them about places that are more remote and where their mental maps might have very little data. So using those two websites, how accurate is this T-Shirt? Now, any ideas on how to verify/debunk the oft repeated statement that Rhode Island is 3% larger at low tide? Any geospatial ideas on how to conceptually go about answering this question? So never mess with the Ocean State…even if this is Texas’ version of Earth Day. National Geographic Education has just finished producing all 50 State Tabletop Mapmaker kits which focus on basic mapping skills for younger audiences. This set of tiled 8.5 x 11 sheets really expands what you can do and to help educators know what to do with these resources, they wrote this article that shows 9 ways to use these new state maps in your classroom. 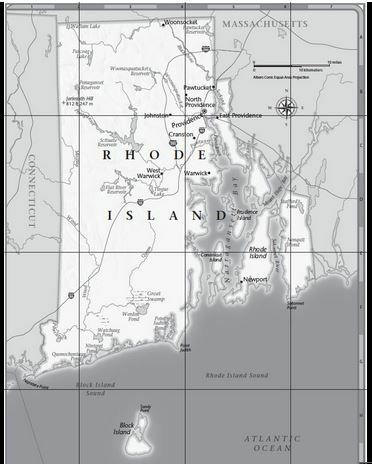 I’m looking forward to printing off the Rhode Island state map! Tags: National Geographic. mapping, K12. This is an incredible resource to visualize the linguistic similarities between European languages all on one interactive map. Just type in a word or phrase as it will translate it for you and place the results on the map. I just found this, but I think it still belongs on my list of favorite resources. Questions to Ponder: Do you see any regions forming? How does language impact the diffusion of people, ideas and goods? Hoe do you think these languages diffused? Tags: language, culture, English, diffusion. The history of baseball reflects the story of expansion in the United States. New cities have emerged and modern stadiums have been built as a growing population fueled the popularity of our National Pastime. The result is an extensive network of baseball teams at every level – from the major leagues to the little leagues – that represent the communities and environments in which they play. Everything from jersey colors, names, and symbols to the foods served at ballparks reflects the local landscape and culture of baseball teams. A simple game that began with a bat and ball is now a comprehensive case study of how people and geography are interrelated. All of the lessons and activities have been prepared to accompany “Geography: Baseball Coast to Coast.” You will find that the curriculum is organized into three levels: Level 1 for elementary school students, Level 2 for middle school students, and Level 3 for high school students. Thanks to the NCGE and the Baseball Hall of Fame for working together to bring us these great resources…play ball!! On a local note, what baseball team is the most popular in your area? Is there a geography to fan support?